As a result, Active Blind Spot Assist may neither give warnings nor intervene in such situations. There is a risk of an accident. Active Blind Spot Assist is only an aid. It may fail to detect some vehicles and is no substitute for attentive driving. In particular, the detection of obstacles can be impaired if there is: • dirt on the sensors or anything else covering the sensors.> R visibility is poor, e.g. 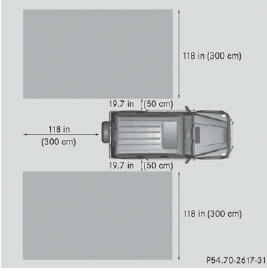 due to fog, heavy rain or snow.> R there is a narrow vehicle traveling in front, e.g. a motorcycle or bicycle.> R the road has very wide lanes.> R the road has narrow lanes.> R you are not driving in the middle of the lane.> R there are barriers or other road boundaries. Active Blind Spot Assist uses a radar sensor system to monitor the side areas of your vehicle which are in back of the driver. A warning display in the exterior mirrors draws your attention to vehicles detected in the monitored area. If you then switch on the corresponding turn signal to change lanes, you will also receive an optical and audible collision warning. If a risk of lateral collision is detected, corrective braking may help you avoid a collision. To support the coursecorrecting brake application, Active Blind Spot Assist also uses the forward-facing radar sensor system. Active Blind Spot Assist supports you from a speed of approximately 20 mph(30 km/h). Active Blind Spot Assist monitors certain areas in the immediate vicinity of your vehicle. Vehicles that approach and drive past at high speeds are not detected. No visual nor audible warnings are emitted and the system does not brake the vehicle to correct your course. If the lanes are very wide, it may not be possible to monitor the complete width of the neighboring lane. For this reason, vehicles in the next lane may not be detected, especially if they are driving in a staggered formation. This may be the case if vehicles are driving at that edge of their lane which is furthest away from your vehicle. Always pay attention to traffic conditions and your surroundings. Otherwise, you may fail to recognize dangers in time, cause an accident and injure yourself and others. Active Blind Spot Assist monitors the area up to 10 ft (3.0 m) behind your vehicle and directly next to your vehicle, as shown in the diagram. For this purpose, Active Blind Spot Assist uses radar sensors in the rear bumper. If the lanes are narrow, vehicles driving in the lane beyond the lane next to your vehicle may be indicated, especially if the vehicles are not driving in the middle of their lane. This may be the case if there are vehicles driving at the inner edge of their lanes. • warnings may be interrupted when driving alongside particularly long vehicles, for example trucks, for a prolonged time. Two Active Blind Spot Assist radar sensors are integrated into the front and rear bumpers respectively. An additional radar sensor is located behind the cover in the radiator grill. Make sure that the bumpers and the cover in the radiator grill are free of dirt, ice or slush. The rear sensors must not be covered, for example by cycle racks or overhanging cargo. Following a severe impact or in the event of damage to the bumpers, have the function of the radar sensors checked at a qualified specialist workshop. 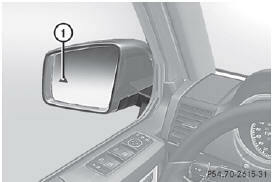 Active Blind Spot Assist may otherwise no longer work properly. Active Blind Spot Assist is not active at speeds below 20 mph (30km/h). The indicator lamps in the exterior mirrors are yellow. Vehicles in the monitoring range are then not indicated. When Active Blind Spot Assist is activated, indicator lamp 1 in the exterior mirrors lights up yellow at speeds of up to 20 mph (30 km/h). At speeds above 20 mph(30 km/h), the indicator lamp goes out and Active Blind Spot Assist is operational. The yellow indicator lamp goes out if reverse gear is engaged. In this event, Active Blind Spot Assist is no longer active. When you switch on the turn signals to change lanes and a vehicle is detected in the side monitoring range, you receive a visual and acoustic collision warning. You then hear a double warning tone and red warning lamp 1 flashes. If the turn signal remains on, detected vehicles are indicated by the flashing of red warning lamp 1. There are no further warning tones. Active Blind Spot Assist is only an aid designed to assist driving. It is not a substitute for attentive driving. In some cases, the course-correcting brake application is not sufficient to avoid a collision. In such a case, you must steer, brake or accelerate. In very rare cases, the system may erroneously detect a danger of collision in the area of crash barriers or similar lane borders and apply the brakes. 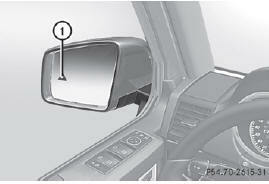 Active Blind Spot Assist does not detect all traffic situations and road users. Always make sure that there is sufficient distance on the side for other traffic or obstacles. An inappropriate brake application may be interrupted at any time if you steer slightly in the opposite direction or accelerate. You are responsible for driving at appropriate speeds, braking in good time, and steering correctly. Always adapt your driving style to suit the prevailing road and weather conditions. Always pay attention to traffic conditions and your surroundings. Otherwise, you may fail to recognize dangers in time, cause an accident and injure yourself and others. If a course-correcting brake application occurs, red warning lamp 1 flashes in the exterior mirror and a dual warning tone sounds. In addition, display 2 appears in the multifunction display. If Active Blind Spot Assist detects a risk of a lateral collision in the monitoring range, a course-correcting brake application is carried out. This is meant to assist you in avoiding a collision. The course-correcting brake application is available in the speed range between 20 mph (30 km/h) and 120 mph (200 km/h). • there are vehicles or obstacles, e.g. crash barriers, located on both sides of your vehicle. • a vehicle approaches you too closely at the side. • you have adopted a sporty driving style with high cornering speeds. • you clearly brake or accelerate. • ESP® is switched off. • the LOW RANGE off-road gear is activated. • a loss of tire pressure has been detected. ► Make sure that active Blind Spot Assist is activated in the on-board computer. correctly established the electrical connection. This can be accomplished by checking the trailer lighting. Active Blind Spot Assist is then deactivated. The indicator lamp lights up yellow in the exterior mirrors and the Active Blind Spot Assist Currently Unavailable See Operator's Manual message appears in the multifunction display.